A recent survey shows that about 39% of employees worldwide believe that people in their organization don’t collaborate enough. Yet nearly 3 in 4 employers rate teamwork and collaboration as “very important.” Not only is proper internal communication within teams key to company success, but a lack of it is counterproductive. This post will help you to improve the team communication in your workplace using messaging applications such as Office Chat. It will also focus on helping your employees to bond better and share ideas with each other while saving time and creating a more efficient work environment. Take a look at these 10 ways to improve team communications at work using messaging applications that you can begin to implement right away. Within every organization, there are common goals that depend heavily upon the cooperation and collaboration of various teams. The first step to improve communication is to identify and establish proper communication channels based on these goals. This will not only have benefits in terms of profitability but also help immensely to make sure that communication is flawless and transparent within teams and eventually the entire company. 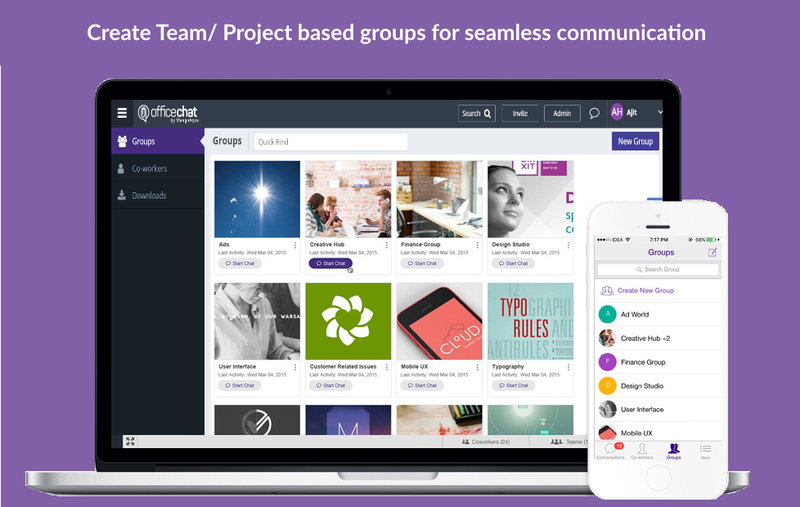 Office Chat team-based groups can help you to create and open lines of communication for specific teams, projects and departments to communicate seamlessly and share ideas and documents within the group. This will help to improve the team communication at work and will also enable them to work towards the larger collective goal. By encouraging effective, more collaborative relationships between employees, colleagues and managers, you’ll be doing an important thing for improving team communication in your organization. The aim must be to connect workers at all levels, where each individual is empowered to share views on topics that matter to him or her. This also helps owners and managers become more accountable while the team invests time and energy into brainstorming ideas that could become highly profitable for the business and improve customer service. It is also important that new concepts are not just discussed among peers but also implemented in a timely manner. Management needs to be involved and receptive of those suggestions from the very beginning. The Private Chats featured within Office Chat will encourage users to interact with colleagues and peers with ease. Managers and supervisors can communicate necessary requirements and feedback with others. One-on-one Private Chats enable more transparency and promote open communication within the company. There was a time when one-way communication was the only approach employed by many businesses. Decisions back then were made completely by upper management and the workers merely followed orders without any scope of contributing ideas or feedback to management. Although it may provide a complete sense of control, one-way communication will shut down ideas from your employees and hamper your growth as compared to competitors who listen to their employees. Office Chat features such as Group Chats and Private Chats are the best way to promote two-way communication. These features will help employees share their ideas and feedback and will help employers to build a company culture that nurtures open communication. Also, the management can still have complete control of their Office Chat network via the Admin Portal. These days, nearly everyone has a smartphone or other smart mobile device. Smartphone technology as a communication tool is of utmost importance. So why not take advantage of the many opportunities granted to us by technological advancement and improve our internal communication? 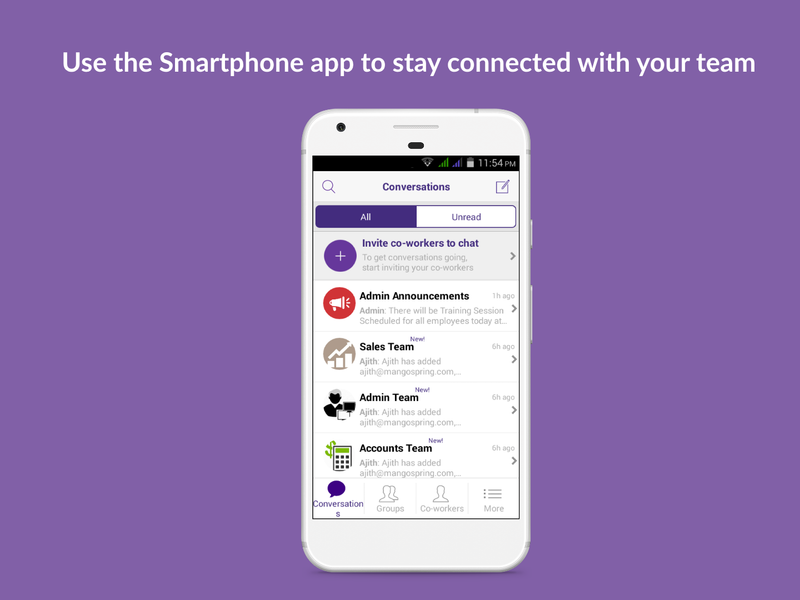 Office Chat is available on multiple platforms including on Android and iPhone. This smartphone app helps users to keep themselves informed with the latest updates via notification in real time. Sharing files, audio, video and GIFs, contributing within a team as wells as one-on-one chats all work seamlessly. It’s almost impossible to improve something if you don’t know what’s holding you back. Traditional communication methods such as email, fax and memos served a valuable purpose at one time, but might not be relevant in today’s modern workplace. Email, for instance, is likely not the best way to have a meaningful conversation with someone. Many successful organizations are now replacing email with instant messaging tools such as Office Chat. Because they realize that relying too heavily on one particularly rigid method of communication hinders their growth. The challenge lies in replacing age-old communication practices with a robust, powerful and secure messaging application. It’s important to engage the workforce and inform them of any policy changes no matter where they are. From new employee introductions and important policy changes to training schedules, these and other news and announcements require a secure, trustworthy solution that assures seamless communication. Communication via smartphone apps enables you to connect with freelancers, remote teams and non-desk workers across departments and locations, while still ensuring engagement and inclusion. The Office Chat Admin Announcements Group helps management to share company-wide updates with its workforce. Events such as new employees, policy changes or any other important updates can be shared with each employee using this feature. As only admins will be allowed to share updates on this group, the information shared here will be authorized, relevant and noise free. Constructive criticism can be hard to give in an office setting. However, everyone in a managerial or administrative position owes it to their colleagues and team to oversee weak areas and strengthen overall performance — so that employees can thrive and grow in the workplace. Also, constructive criticism from colleagues or peers will make sure that the quality of the work is improved and issues are rectified on time. This will help develop an ecosystem of open communication and transparency. Sharing of ideas from the workforce to the management helps in building trust and improve performance. One of the advantages of having a simple and secure instant messaging application like Office Chat is that the feedback can be shared in a transparent and timely manner. Simply create a group to include only relevant users to share ideas and brainstorm. Constructive criticism or feedback can also be shared with the relevant users using Office Chat. While traditional means of knowledge sharing are certainly valuable in the workplace, there is a need to replace obsolete and limiting means of sharing information. We must re-frame traditional file sharing mechanisms to encourage knowledge sharing amongst our employees. Office Chat not only gives you the option to send text messages, but you can also share documents, videos, and more. Upload files, images, and video (any size up to 2 GB) in any conversation. Sharing images, videos, audio and GIFs is as easy as selecting the appropriate icon. With Office Chat, you can simply drag and drop attachments and files. With over 100 GB of file storage and features to search chat history and even file contents, you can easily share relevant files and attachments with your colleagues and managers. Unproductive meetings have become a global epidemic. These unproductive meetings clog calendars and prevent progress towards most important goals. Typically, these types of meetings result in conversations wandering around aimless chatter. Scheduling more physical meetings is far from the solution to improve internal communication. 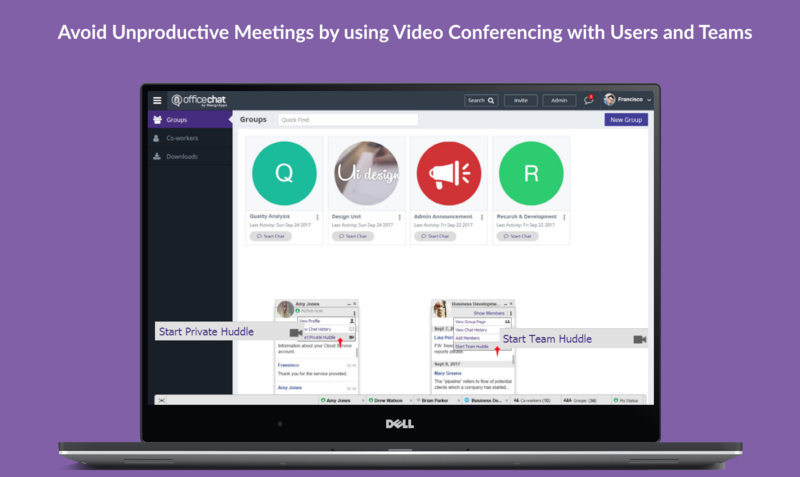 You can completely skip unfocused, unproductive meetings by using the Office Chat huddle feature. This feature helps you to conduct team meetings via video conferencing using third-party applications. You can invite essential people only, set an agenda, end meetings on time, and appoint presenters to keep the discussion focused during the meeting. Expanding access to workplace flexibility is a priority that is critical to help employees work efficiently and improve productivity. With more working parents taking responsibility to find equilibrium between their work and their family, it is the organization’s imperative to offer necessary tools to enable this. With the technological advancements in recent years, introducing a company culture that facilitates workplace flexibility need not be tedious. With Office Chat, you can help your employees find work+life balance and still ensure that they are able to maintain their productivity. Reach out to remote teams and freelancers by ensuring high accessibility from multiple Office Chat platforms. You can use online presence, custom status and huddle feature to stay connected with your team. 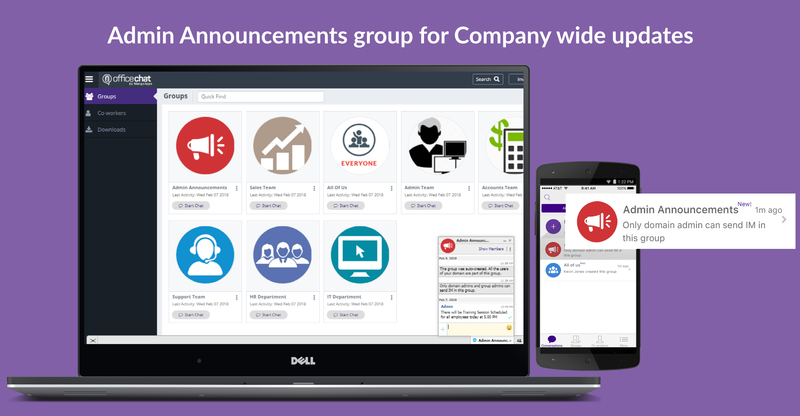 Built for Business: Office Chat premium gives company admins a web-based admin portal with full administration control to: manage users, teams, messages, SSO integration with company's active directory, the usage and engagement dashboard, and email support 24x7. Email Interoperability: Office Chat allows you to send a message to anyone in your company. Users without the Office Chat app installed on their phone or desktop can participate in conversations via email. Available on Mobile, Desktop, and Mac: Office Chat is the only business messaging solution today that can get everyone in the company on board. 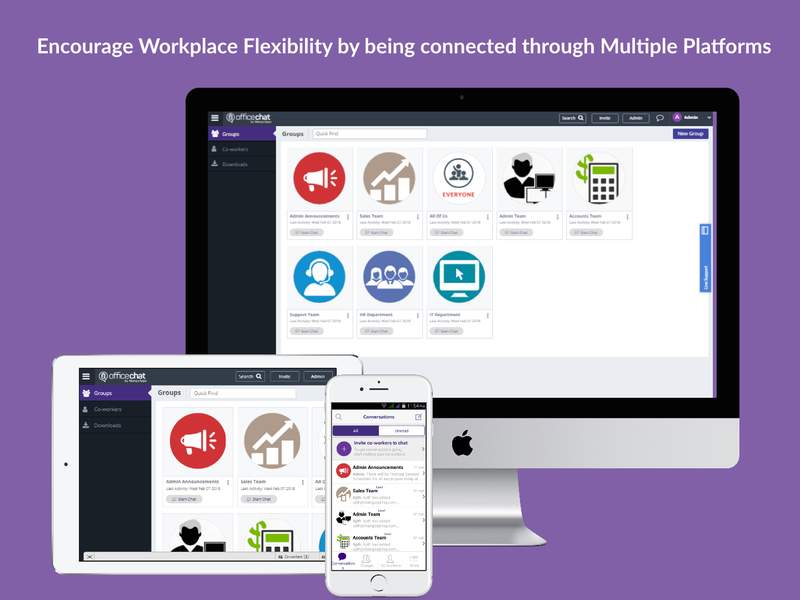 It connects your mobile workforce using iPhone, iPad, or Android along with workers using Windows Desktop or Mac. Office Chat is a Fast, Simple and Secure Mesaging App For Desktop & Smartphones. Mobile teams and businesses use Office Chat to share rich messages, documents, videos and location with their colleagues. These teams are typically < 50 people. Office Chat available for FREE thru' various App stores or on OfficeChat.com. Is Your Instant Messaging Application Really Secure? Office Chat vs. Trillian for Business: Which App is a Winner? Office Chat is just like texting, but it works on both your desktop computer and mobile phone. This allows you to Instantly reach everyone in your company, whether you are in the office or out in the field. Plans start at just $25/mo for 10 employees.